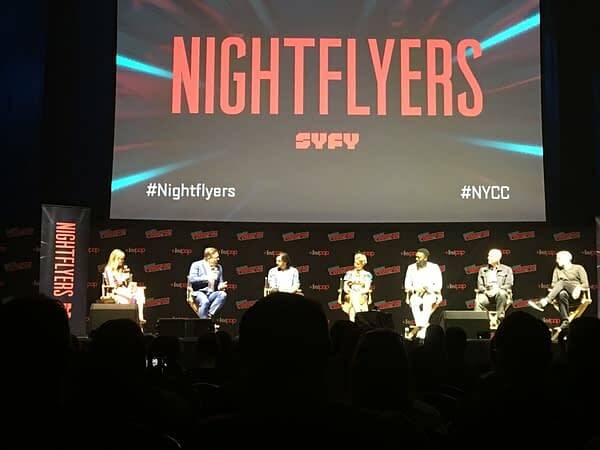 SyFy premiered the pilot episode of Nightflyers to New York Comic Con on Friday. Adapted from George R.R. Martin’s award-winning novella, the 10-part series is set on a spaceship on a mission into deep space to make first contact with an advanced alien species who might hold the key to saving humanity from a dying Earth. The mission becomes increasingly paranoid when sabotage, hallucinations and murder attempts ensue, and suspicion falls on the dangerous psychopath they brought with them to communicate with the aliens. Yes, they brought a telepath with sadistic and psychopathic tendencies with them on a mission to deep space to save Humanity. Soon everyone is in deep trouble. And that’s just the pilot. The show is certainly very slick with a proper amount of money spent on it, a lot more than what was spent on the 1987 movie that’s largely been forgotten. Production took six months at a new studio facility in Limerick, Ireland, which explains why aside from Gretchen Mol, the cast was mostly British or Irish. After the screening, stars Eoin Macken, Gretchen Mol and David Ajala joined showrunner Jeff Buhler and executive producers Gene Klein and David Bartis on stage for a quick panel. They actually happened discussed spoilers for the series for the next half-hour, which I will not mention for the sake of the spoiler-sensitive. Buhler talked about the extensive changes the show made from Martin’s original story. Where the prose original was set hundreds of years in the future where humanity co-existed with several alien species, the show is set in 2093 where Humanity is going to make first contact with an alien species from outer space for the first time. Buhler also talked about how he altered some of the characters and story so the show can run for more than one season rather than be a one-off story like the original novella was. The most notable thing about the pilot – and the subsequent nine episodes – was how Buhler admitted that he and his writers leaned in deep on the horror side of the story. There callbacks and easter eggs referencing many key horror movies, including Nic Roeg’s Don’t Look Now, Tarkovksy’s Solaris (admittedly not exactly a horror movie), The Exorcist, Event Horizon and probably many more as the series goes on. This is a horror story in space, so if you like this type of thing, then this is the type of thing you will like. SyFy is taking a similar approach to their release of the final season of 13 Monkeys. Nightflyers will debut on Sunday December 2nd with the first five episodes running on concurrent nights through to Thursday December 6th, and then all the episodes will be available for streaming on demand. The second five episodes will be broadcast from Sunday December 9th to Thursday December 13th and then available on streaming. 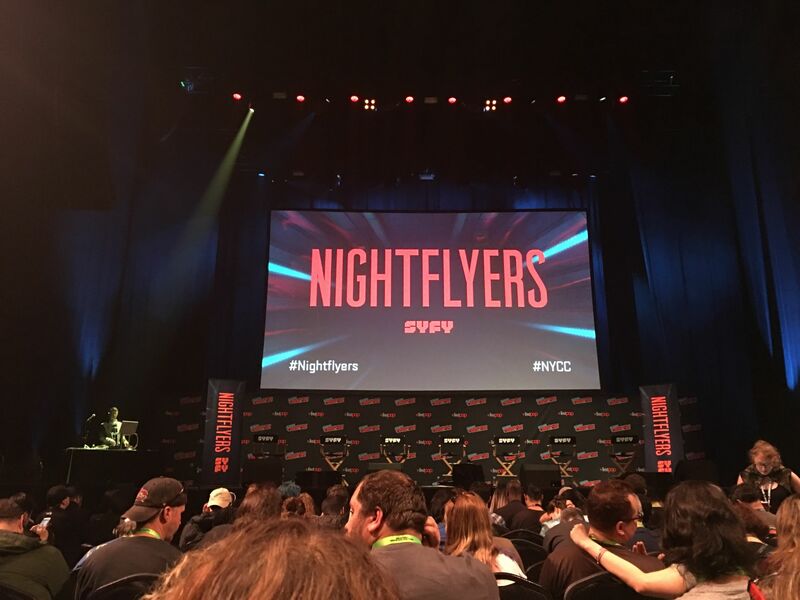 Wanna See SYFY's 'Nightflyers' Opening Scene?